These ‘out there’ meetings will be interspersed with bimonthly ideas meeting held on the first Thursday of each month at REconomy Centre as per normal mode of operation. The next meeting at REconomy centre will therefore take place on Thursday 4th January at 6:30pm. The TTT Eco Fair on Saturday October 21st was a great opportunity to engage folk and spread the word and there was a good deal of positive feedback about the projects we presented. 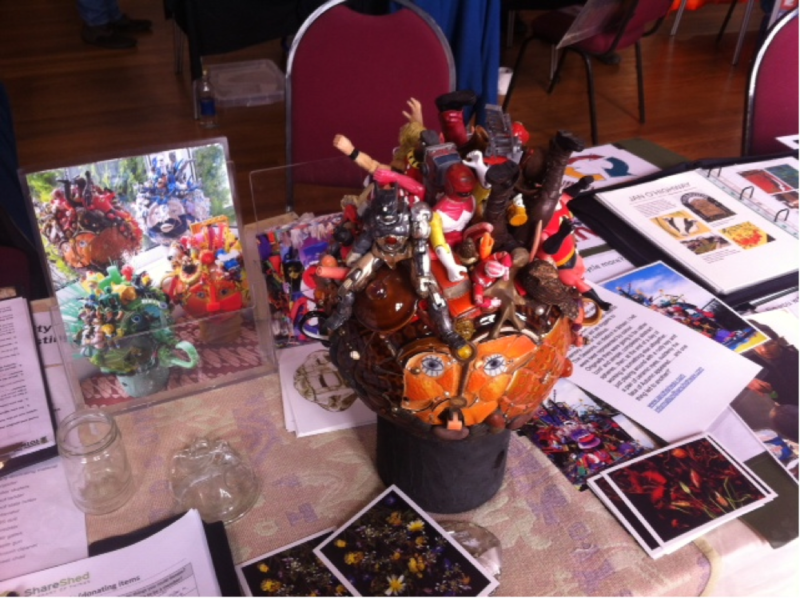 Ben Bryant from TTT Rethinking Waste shared a table with Jan O’Highway of the newly formed arts groups, and displayed an art installation from recycled plastic named the Four Seasons with the Autumn head featuring. 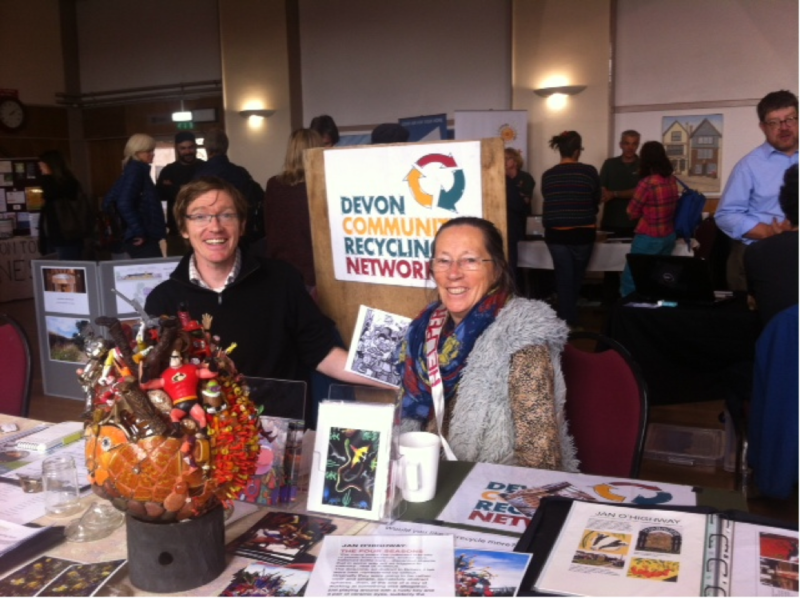 Furthermore there was considerable support for a community composting project in Totnes to help keep fertility in the soil locally and produce a high quality growing medium for local people, a Totnes Compost. So far nearly 100 surveys have been submitted which demonstrate the need for local solutions to deal with out resources. Proximity Principle is a cornerstone of good resource management. Why take our precious resource out of the district and see nothing coming back. The group is exploring various ways of closing the recycling loop and helping develop a circular economy locally. Watch this space. 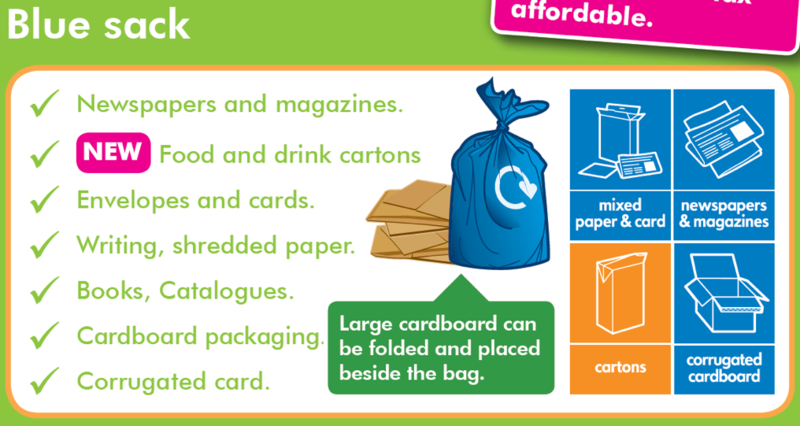 Recycling Tip – Did you know? Residents in the South Hams can now recycle beverage cartons (aka tetrapaks) via the councils fortnightly recycling collection? Many people in the Rethinking Waste group were unaware of this service improvement but having checked the updated South Hams Recycling Guide we can confirm it is true and what good news it is too. The ACE Group of carton manufacturers (inc. Tetrapak) have invested a huge amount into trying to stimulate more carton recycling across the UK and recenelty built a reprocessing facility or mill for recycling cartons near Halifax.